Penny Candy Books, 9780998799940, 40pp. 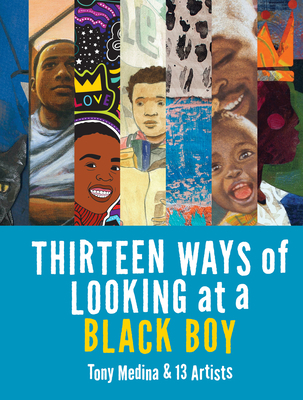 Thirteen Ways of Looking at a Black Boy by Tony Medina offers a fresh perspective of young men of color by depicting thirteen views of everyday life: young boys dressed in their Sunday best, running to catch a bus, and growing up to be teachers, and much more. Each of Tony Medina's tanka is matched with a different artist--including recent Caldecott and Coretta Scott King Award recipients. Tony Medina is a two-time winner of the Paterson Prize for Books for Young People (DeShawn Days and I and I, Bob Marley), is the author/editor of nineteen books for adults and young readers. A Professor of Creative Writing at Howard University, Medina has received the Langston Hughes Society Award, the first African Voices Literary Award, and has been nominated for Pushcart Prizes for his poems. Jacar Press recently published his anthology Resisting Arrest: Poems to Stretch the Sky, on police violence and brutalities perpetrated on people of color. Tu Books published Medina's debut graphic novel I Am Alfonso Jones in 2017. He lives in Washington D.C. Javaka Steptoe's debut picture book, In Daddy's Arms I Am Tall: African Americans Celebrating Fathers (Lee & Low Books, 1998), earned him a Coretta Scott King Illustrator Award and a nomination for Outstanding Children's Literature Work at the NAACP Image Awards. Since then Steptoe has illustrated and/or written more than a dozen books for young readers, collaborating with some of the top names in the business, such as Walter Dean Myers, Nikki Grimes, and Karen English. His latest book, Radiant Child: The Story of Young Artist Jean-Michel Basquiat (Little, Brown, 2016) won the 2017 Caldecott Medal and 2017 Coretta Scott King Illustrator Award. R. Gregory Christie is a five-time recipient of the Coretta Scott King Honor Award in Illustration. He is the designer of the 2013 Kwanzaa Forever stamp for the United States Post Office, a two-time recipient of the New York Times 10 Best Illustrated Children's Books of the Year Award, and an NAACP Image Award recipient. His most recent book, Freedom in Congo Square, won a 2017 Caldecott honor. He has illustrated more than 50 books, a multitude of magazine images, and many jazz album covers. You can visit him at his Decatur, GA bookstore, GAS-ART GIFTS, or online at www.gas-art.com. Ekua Holmes's collages celebrate the vibrancy of urban life and the joys and challenges of childhood. She was the recipient of a 2013 Brother Thomas Fellowship from The Boston Foundation for her contributions to the Boston arts community. In 2014 she became the first African American woman to be appointed to the Boston Arts Commission. Holmes's debut as a picture book illustrator, Voice of Freedom: Fannie Lou Hamer: The Spirit of the Civil Rights Movement (Candlewick, 2015) by Carole Boston Weatherford, received a Silver Medal from the Society of Illustrator's Original Art exhibition, the Robert F. Sibert and Randolph Caldecott Honors, and a Coretta Scott King John Steptoe New Illustrator Award. With over 100 children's books to his name, Floyd Cooper is a master craftsman of children's literature and illustration. He has received numerous awards and praise for his work, including three Coretta Scott King Honors, an NAACP Image Award, the Jane Addams Peace Honor, the Simon Wiesenthal Gold Medal, and the prestigious Sankae Award of Japan. He is the 2018 artist for the U.S. Postal Service KWANZAA Forever stamp. This Tulsa native now makes his home in Easton, PA, with his wife Velma, sons Dayton and Kai, daughter-in-law Melissa, and grandson Niko. Plus nine more illustrators!